Every year around Christmas I find myself in need of more storage. Often times I also need to do a bit of rearranging to make room for new books, toys, and games in our current space. 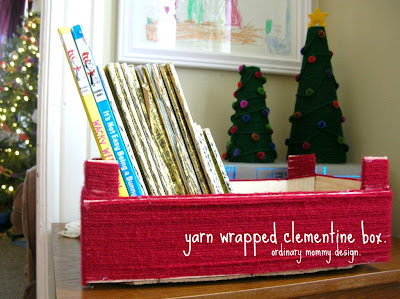 I shared some creative shoe box storage recently, but I also love to repurpose clementines boxes. Clementines are great because they're super tasty, and they come in a wonderful box all ready to store scarves or books, or organize like items in the kitchen pantry. 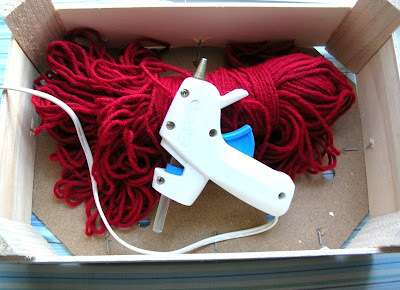 The last box that came into the house got a makeover by being wrapped in yarn. The shape of clementine boxes can be a little bit challenging to cover, so I wouldn't necessarily recommend this project for someone who is an intense perfectionist as it can be difficult to cover up every inch of the box underneath the yarn. Also, this post is not very image heavy, as my memory card went and corrupted almost all of the files. But as each clementine box is a bit different anyway, you'll just have to figure out what works best for yours. I began by wrapping each post of my box individually. You'll want to apply a dab of hot glue at the beginning and end to adhere the yarn. Be careful not to burn yourself; I found that using the side of a pencil worked well to press the yarn into the glue without it sticking to my fingers. Try to be a bit stingy with the glue so it doesn't make a mess and get stuck to the yarn in places you don't want it to be seen. Once you've got the posts wrapped, start at the top of the box and wrap around it until you get to the bottom, occasionally applying some hot glue to keep the yarn in place. I also glued a piece of yarn to the very top edge of each side of the box. Clementine boxes are the perfect size for kids books. Depending on the surface where you'll be storing it, you may want to consider gluing a piece of felt to the bottom of the box so it won't leave scratches when moved; if using the box for storing kid items it would be really cute to glue their name to the front using fabric or wooden letters. 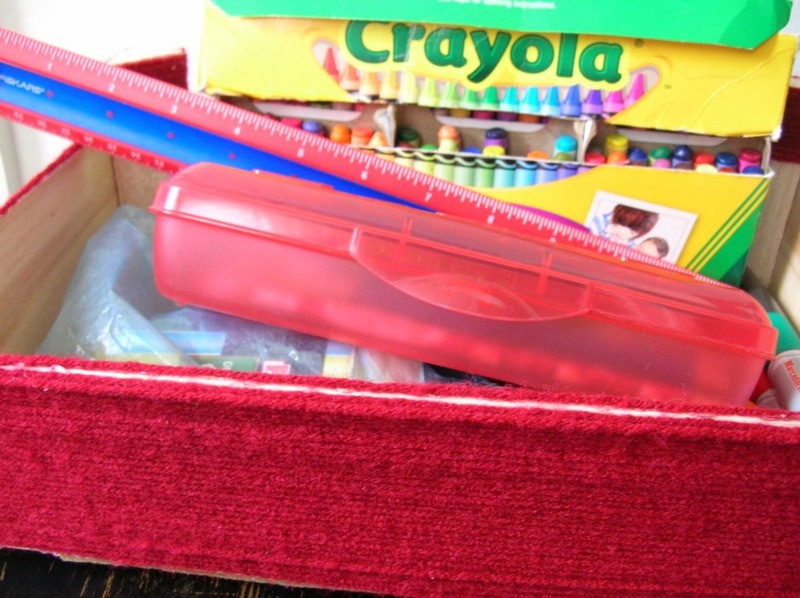 For storing fabric items it's a good idea to adhere a piece of felt to the inside of the box on the bottom as the texture of the box can pull at fabric. I use a clementine box to store school supplies we use daily, and with its new yarn-covered facade the box will blend nicely into it's surroundings on the bookshelf. I hope to share more about our bookshelf storage area soon! really cute and clever, Faith! I'm glad you posted this. Thanks Faith! I was just trying to figure out something to do with my clementine box last night! This post came in perfect timing!